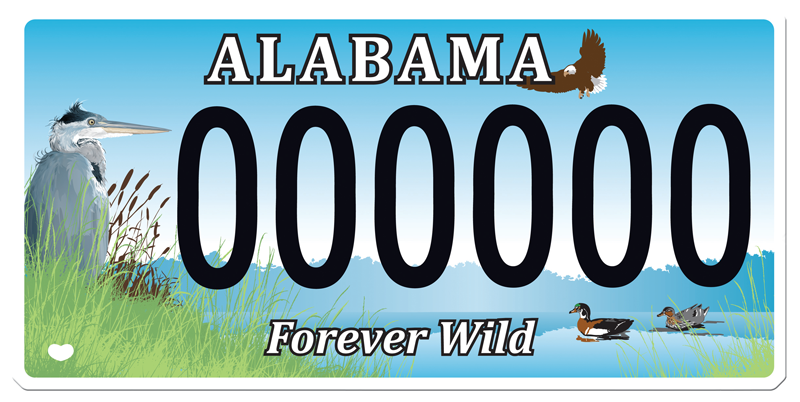 Purchasing a Forever Wild license plate for your vehicle is an easy and effective way to share with others the importance of protecting Alabama’s natural heritage. Purchase yours today and show your support of Forever Wild! How much is a Forever Wild license plate? The cost is $50 per year, with $42.50 from each sale going directly to the Forever Wild program. There is also a one-time $5 fee when the newly designed metal tag is first issued. When is the best time to purchase a Forever Wild license plate? Most people obtain one when it is time to renew their current license plate, but you don’t have to wait. You can purchase a Forever Wild tag at any time during the year. Where do I get the license plate? License plates may be purchased at county title and registration offices across the state. Can I personalize the license plate? Yes, personalization is available at no additional cost. Six is the maximum number of letters or numbers for a personalized tag. Personalized messages must be approved by the Department of Revenue. You can reserve a personalized tag online. The personalized license plate reservation will be held for five business days. Reservations must be redeemed at the licensing official's office within this time or the reservation will be forfeited. Money from the sales of Forever Wild license plates can be used to help fund land acquisitions, educational programs and public awareness of the Forever Wild Land Trust.